I am not a particular fan of landscape photography. It doesn’t move me. Don’t get me wrong; I’ve spent a great deal of time in natural places of staggering beauty and I appreciate the allure of the landscape. But for the most part, landscape art doesn’t seem to hold my eye for more than a moment. Maybe it’s the lack of new visual information; the beautifully still lake, the majestic mountains, the trees in all their varied colors, the fields of wheat or wildflowers…I’ve seen them all before. They remain lovely, of course, and in real life I can look at the landscape for hours. But for the most part, photographs and paintings of landscapes fail to hold my interest. 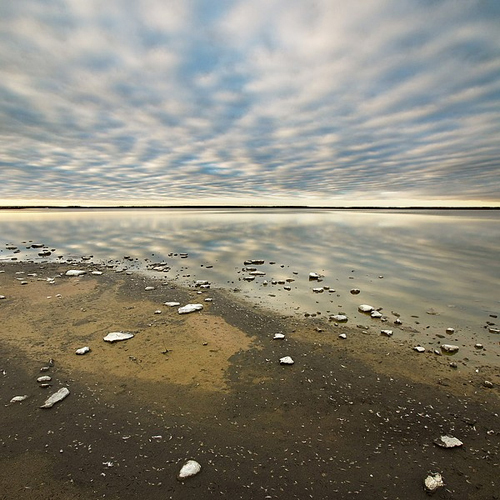 So there’s absolutely no reason for me to like the landscape photographs of Canadian photographer Eric Fredine. In fact, there’s less reason for me to like his work because his landscapes lack the more traditional elements of landscape art. 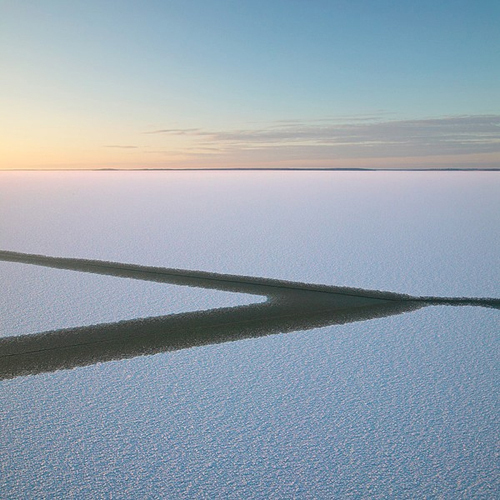 Fredine photographs the great Canadian prairie, a vast plain of uncompromising flatness. And yet, I find his images oddly compelling. It’s not surprising to learn that these strange, tightly-controlled, linear photographs are the work of an engineer. Fredine came late to photography. In 2001, at the age of 37, he bought his wife a digital camera as a gift. When she was slow to experiment with it, he essentially commandeered it for his own use. “I was hooked by the fact that I could control everything,” Fredine said. Beginning with that camera and eventually graduating to a 4×5 view camera, he began to photograph the Alberta countryside…the prairie, the shallow lakes and sloughs, the bogs, the fields. Three years later, Fredine had quit working full-time as a computer engineer in order to devote more time to photography. The result are laminar landscapes almost entirely devoid of a sense of scale. These images are all about length and width; there is no height…and the eye almost aches for that third dimension. As Gertrude Stein said of her birthplace of Oakland, California, there’s no there there. What IS there, however, is an eerie sort of primal beauty. Fredine’s images have a quality that is prehistoric, or possibly post-apocalyptic. They exist outside of any human context. They could have been taken at the dawning of the world, or at the twilight of existence. There is nothing to seize the eye, but the nothingness is compelling. The poverty of visual reference doesn’t equate to a poverty of emotion. These photographs are, to me, powerfully and profoundly moving. They reinforce one’s sense of smallness, of aloneness. As I said at the beginning, I’m not a particular fan of landscape photography. 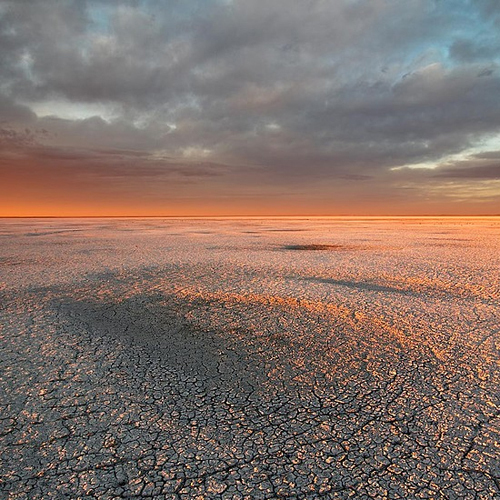 Fredine’s photographs, though, seem more like landscapes of an alien planet. I am nearly as awed by them as I am of the images taken by the Mars rovers.